This is a large genus of some 97 species in Southern Africa, many of them obscure and uncommon and all of them small to medium in size. The two illustrated here are widespread and others will be added from time to time. All the species have spines on the propodeum [last segment of the thorax] and distinct creases or ‘wrinkles’ on their heads – you need a good magnifier to see these. 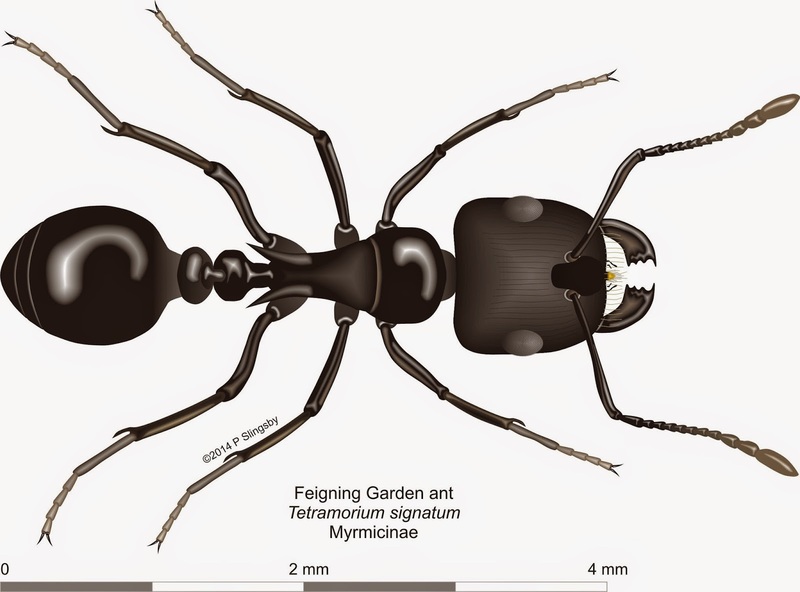 The Feigning Garden ant, T. signatum, is widespread in the more arid regions of the province, extending up the west coast and into Namibia and Angola. It has a unique characteristic of folding itself up into a foetal (pupal?) position and feigning death, when touched or threatened. 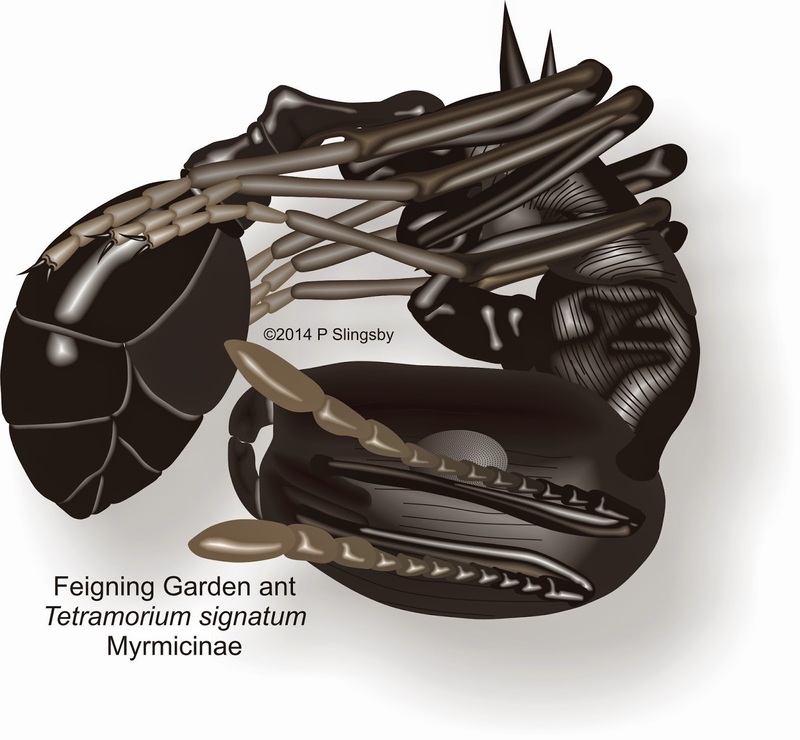 The ants are harvesters, scavengers and occasional hunters, short and stocky and about 4mm long. They run in rather vague trails that ‘freeze’ if you thump the ground near them. Slow moving and shy, they seem to survive by passive resistance rather than aggression. The nest entrances are often surrounded by distinct cones of excavated sand. The Black Garden ant, Tetramorium sericeiventre [was Tetramorium quadrispinosum, but this name is no longer valid] is much more widespread than T. signatum and is one of the few indigenous ants that can survive the invasion of its habitat by alien Argentine ants (Linepithema humile). Like its cousin above it employs a sort of passive resistance to achieve this, but instead of feigning death it stands absolutely still until the aggressor loses interest and wanders off. It occurs in gardens and is widespread in fynbos, strandveld and the karoo. The colonies are small, consisting of a few hundred individuals in a nest of underground tunnels. There is some variation in colour and size (but not in the same nest), and these variations may indicate separate species. 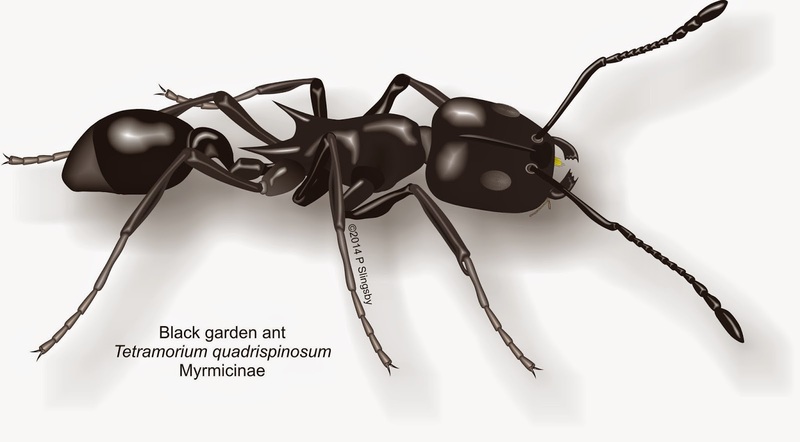 The colour varies from overall jet-black, to ants with black gasters with dark brown or even deep magenta thorax and head. 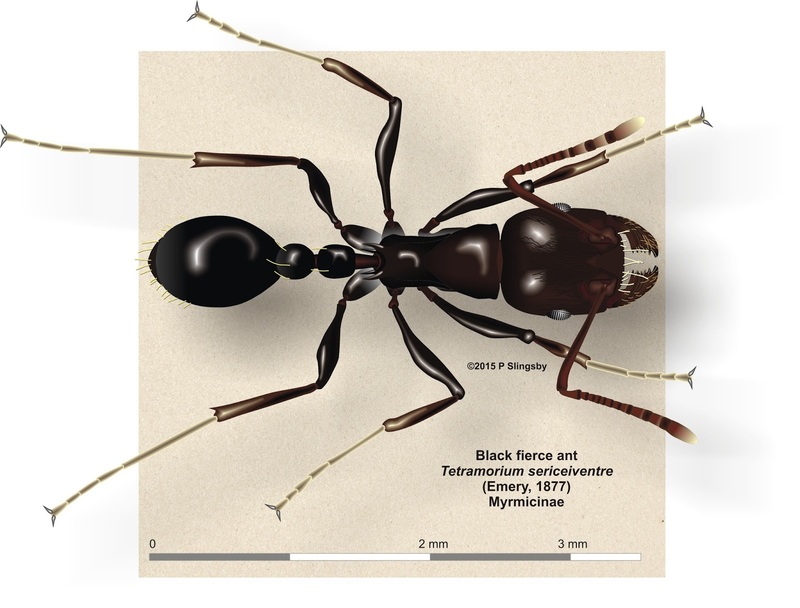 The size is normally less than 4 mm; under certain circumstances they can be surprisingly aggressive.